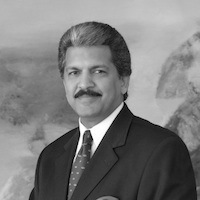 Growing Mahindra & Mahindra into a US$12.5 billion organisation under his tenure – and evolving it into a socially and environmentally responsible global federation of companies with a leading presence in each of its sectors – Vice Chairman and Managing Director, Anand Mahindra is a recognised business thought-leader and global influencer with over 346,000 followers on Twitter. A regular at the World Economic Forum’s annual meetings, and its co-chair in 2009, he was named by Fortune magazine as one of the top 25 most powerful business people in Asia for 2011. "A firm believer in the power of education, Anand Mahindra initiated the Nanhi Kali programme two decades ago to provide free education to economically underprivileged girls in India. Today there are over 70,000 Nanhi Kalis across the country. Mahindra believes that a study of liberal arts is essential in shaping leaders of the future. He has given the largest recorded personal donation overseas by an Indian – an endowment of US$10 million - to the Harvard Humanities Centre, which is being re-launched as the Mahindra Humanities Centre."